Krombacher “Low-Alcohol Pils” is a 0.5% pilsner lager produced in Germany. In this review, get tasting notes and carb, sugar and calorie information. Plus find out how it’s made and where to buy it. Like many countries, beer sales are on the decline in Germany. In 2017, Germans drank a third less beer than they did in 1980, when post-war beer consumption peaked. However, these figures don’t include consumption of alcohol-free beer, which has been steadily gaining popularity since the first non-alcoholic beers appeared in the 60s and 70s. Nowadays there are more than 400 alcohol-free beers to choose from according to the German Brewers’ Association. In total, it accounts for 6% of beer consumption compared to around 1% in the UK. 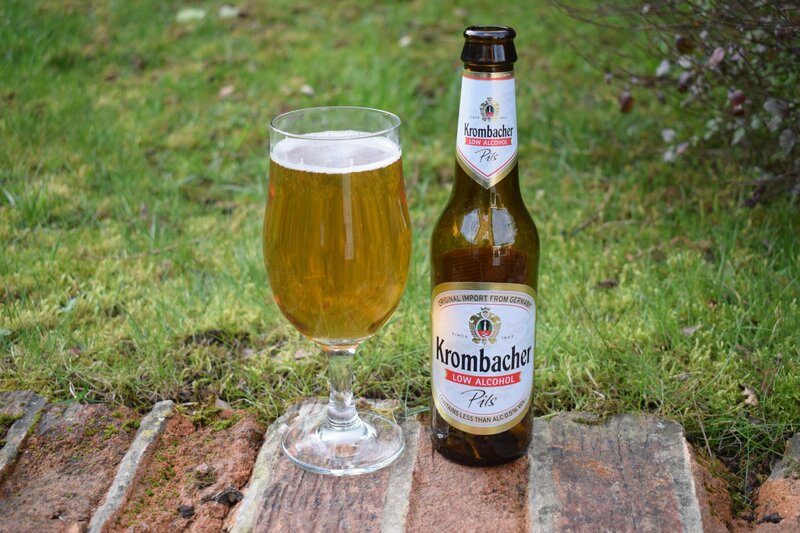 The Krombacher brand was pretty late to non-alcoholic beer when in 1999 it launched its 0.5% ABV “Alkoholfrei Pils” (labelled as “Low-Alcohol Pils” in the UK to confirm with the Government’s ill-thought-out labelling guidance for drinks between 0.05 and 1.2% ABV). The brewery was originally founded in 1803, and just about survived the war years to become one of Germany’s largest privately owned breweries, apparently now producing one in every five pilsners consumed in the country. 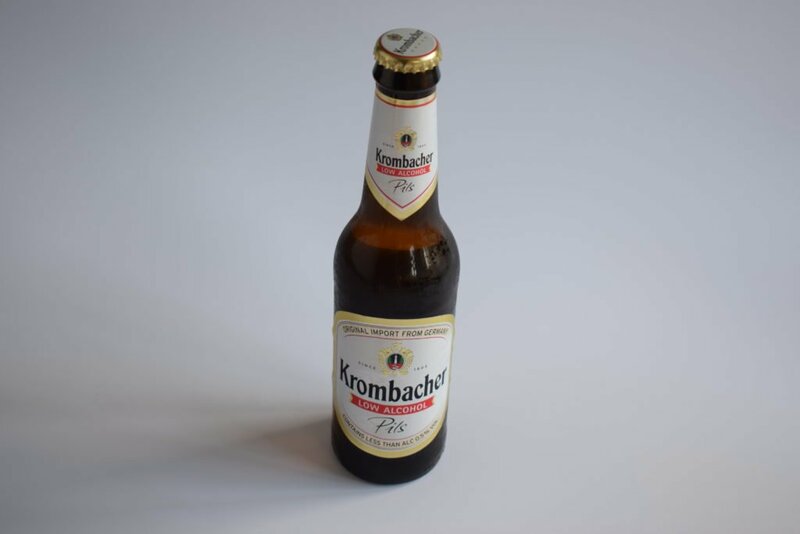 As well as a 0.5% version of its pilsner, Krombacher also produces two alcohol-free wheat beers and a radler. 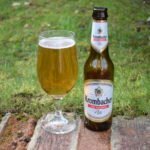 How is Krombacher Low-Alcohol Pils made? Although it produces its alcohol-free beer in two specially built brewing plants, brewers remove the alcohol after fermentation rather than brew a low-alcohol pils from the off. Ingredients are sourced locally and include Hallertau hops, a classic hop that features in many German pilsners. Krombacher Low-Alcohol Pils pours golden, with a small head of foam that leaves a satisfying trail down the glass as you drink. It’s not as clean-smelling as it could be. There’s an aroma of lager maltiness mingling with smells of corn, brown bread and unfermented wort. There’s a medicinal tinge too, much like the aroma of root beer. The body is good with tight bubbles and a smooth mouthfeel. It’s highly carbonated. Again, there’s some maltiness in the flavours but it’s grainy and worty. There’s little sweetness, yet it tastes overly sweet because there’s not enough bitterness to balance it out. Krombacher Low-Alcohol Pils has good body and a decent enough mouthfeel. But the aroma and taste, which feature some undesirable flavours, let it down. Still, it’s still a decent alternative to other soft drinks if you’re not drinking alcohol. But there are better alcohol-free lagers out there.